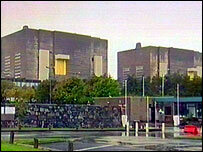 In the vast concrete hulks of Trawsfynydd's old nuclear reactors, the air is monitored constantly for radioactivity. Only two nuclear power plants were built in Wales - one at Wylfa, which is due to close in 2010, and another at Trawsfynydd, now being taken slowly apart. 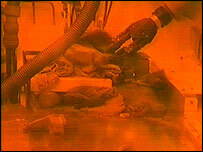 With the highly radioactive nuclear fuel already removed to Sellafield for reprocessing a decade ago, the most dangerous material left on site is so-called intermediate waste. In Trawsfynydd's case this includes radioactive metal that surrounded the fuel rods in the reactors. No human can come near it. It is moved around the site in a network of tunnels monitored remotely on CCTV. It is brought up into a chamber where, protected behind thick glass, operators use robotic arms to sort it and place it in strong boxes. The process is so laborious it takes weeks to fill just one small box. Then each one is injected with concrete and, using remotely controlled heavy lifting gear, they are put into even bigger concrete containers with walls half a metre thick. These 40-tonne concrete 'overpacks' will stay on site in their own new building for 40 years, pending a decision on a new UK site for intermediate waste. Returning Trawsfynydd to a green-field site will cost more than £1bn, according to Simon Parsons of the British Nuclear Group. "It's an expensive business, but we're trying to find ways of reducing the cost," he said. It is the cost and environmental concerns about waste that had all but written off the industry. Many experts say the commercial risks involved with nuclear are so great, no-one will put money into it. Professor Gordon McKerron, of Sussex University, says the problem is no-one has built a reactor for so long, no-one knows the cost. "The financial risk may be overwhelming, unless you can internationalise the building of reactors," he said. The industry itself says with some government support, nuclear could have a future. "We aren't looking for a lot of support, because we believe an economic case for nuclear can be made," said Philip Dewhurst of the Nuclear Industry Association. With most of the UK's reactors due to be decommissioned by 2020, the prime minister has called for nuclear's future to be debated. But this has not gone down well among senior ministers in Wales. Welsh Secretary Peter Hain recently spoke out against more nuclear plants in Wales, while the Welsh Assembly Government (WAG) has been busy promoting other sources of energy including wind. WAG said it expects its views to be heard during the forthcoming energy review. It may not want to see new nuclear stations here, but one major employer - Anglesey Aluminium - has linked its future in Wales to getting cheap reliable energy and its depending now on the nuclear reactor at Wyfla. Much then is at stake in the growing energy debate.